I’m always on the outlook for hundred-year-old snack and appetizer recipes. I recently found a recipe in a 1919 cookbook for Cheese and Rice Fritters. They were crispy on the outside and tender on the inside, with a subtle cheese and tomato flavor. And, they were amazingly similar to an hors d’oeuvre that I recently had at a catered event. In a mixing bowl, combine approximately 1 cup of pureed rice, salt, paprika, baking powder, and flour; stir until thoroughly mixed. 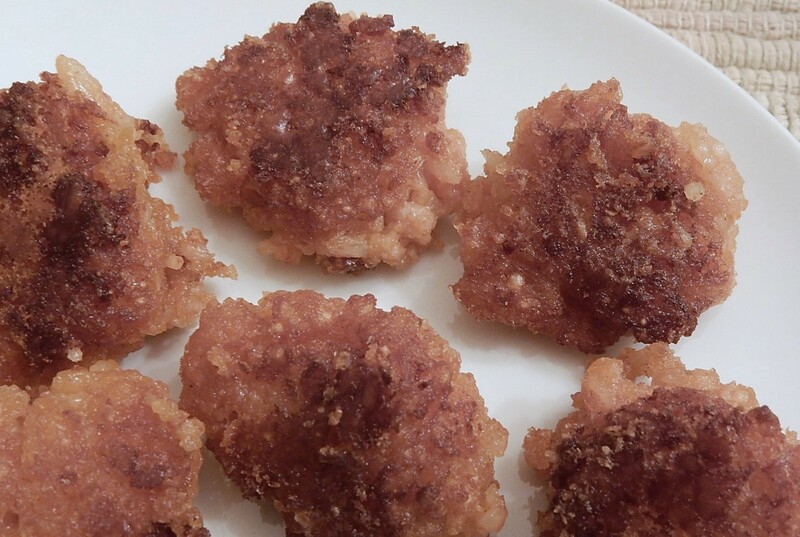 (There may be extra rice that can be eaten or used in another recipe.) Add grated cheese and stir until the cheese is evenly distributed throughout the dough. If dough is too dry, add 1 – 2 tablespoons of water; if too moist, add 1 or tablespoons of additional flour. Heat 1/2 inch of shortening or lard until hot in large frying pan. Drop heaping teaspoons of dough into hot shortening. Flip fritters and fry until golden brown on both sides. Remove from heat and drain on paper towels. Serve immediately. I used more rice than called for in the original recipe because 1/4 cup did not seem like enough to end up with 1 cup of pureed rice. 1919 magazines were filled with articles about World War I, and how the U.S. and other countries were returning to normalcy following the end of war. 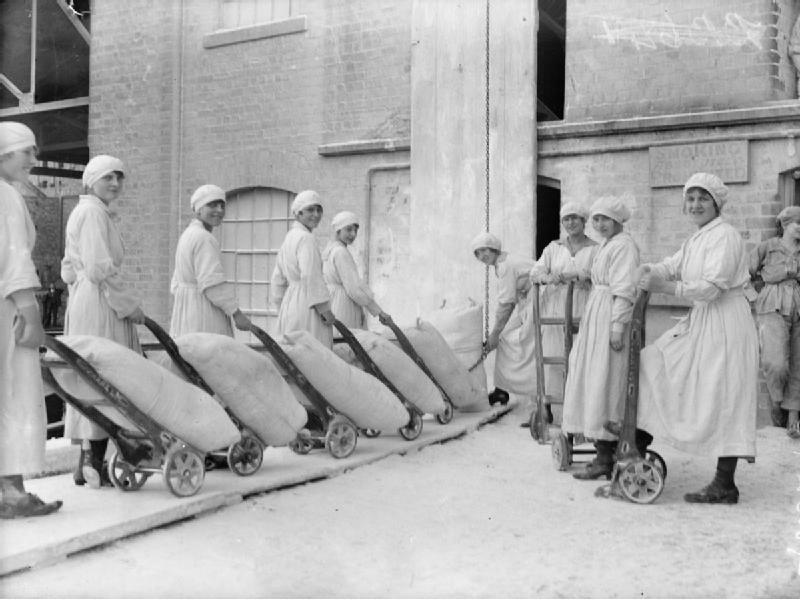 During the war, Americans conserved food and were able to send huge amounts of flour and sugar to Europe to feed the troops and others in need. More than 6,000,000 old-fashioned American cookies have been manufactured in France and distributed with the compliments of the American Red Cross to the soldiers in service, the wounded in hospitals and to scores of canteens. Within a month it is expected that 700,000 will be made a day. At present the output is 200,000 a day. It is the belief of Red Cross officials that the manufacture of cookies will not be affected by the cessation of hostilities. It is pointed out that there is a six-months stock of sugar and one and a half years’ supply of flour in storage for making the cookies. I recently came across a hundred-year-old recipe for Blueberry Duff in the February, 1919 issue of Good Housekeeping. Duffs often are steamed puddings – but this recipe is very easy to make and calls for baking the duff in the oven. 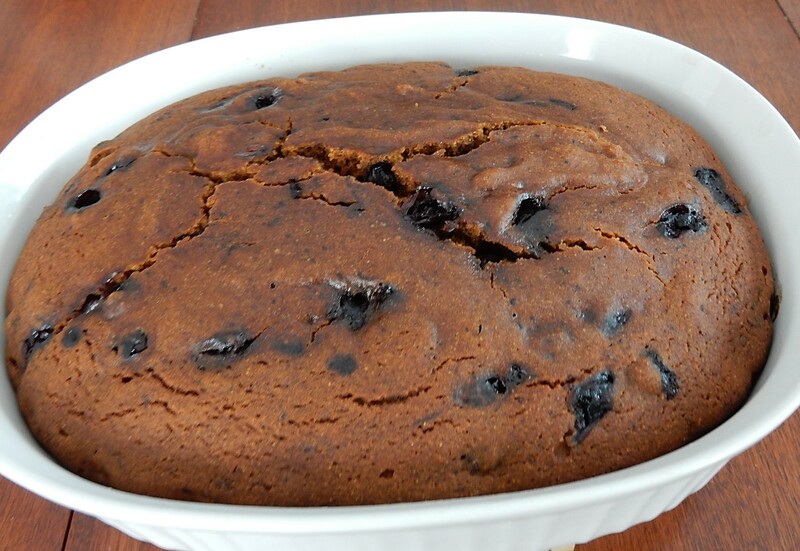 This Blueberry Duff is moist, rich, and spicy. 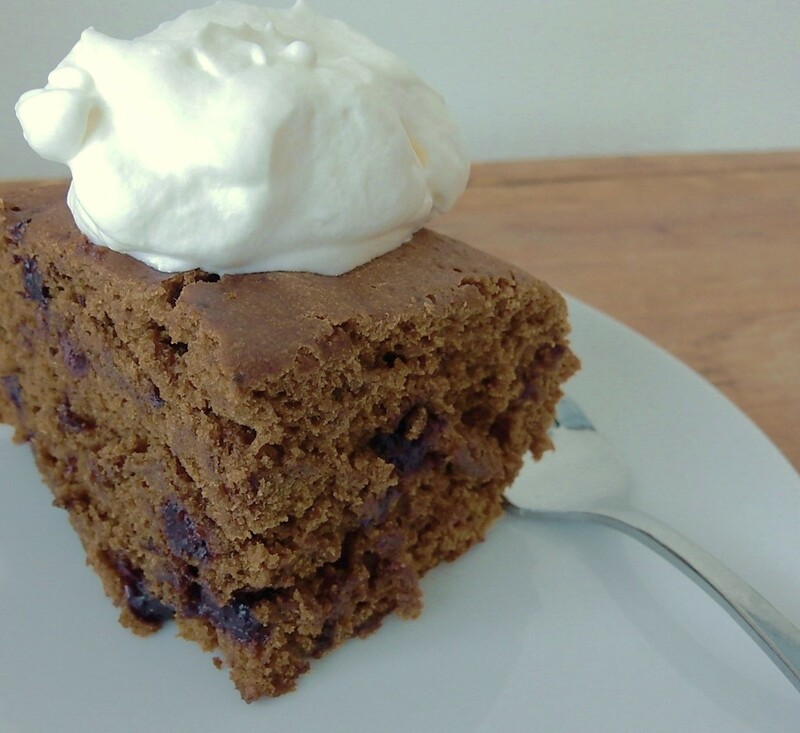 It contains molasses, well as cinnamon, ginger, and cloves. The recipe calls for canned blueberries. I’m fascinated by what people ate during the winter months in the days before modern transportation allowed produce to be shipped thousands of miles. In 1919, fresh blueberries, were not available; but people regularly ate canned (either home canned or commercially canned) blueberries. Drain canned blueberries; reserve both juice and berries. Preheat oven to 350° F. Put all-purpose flour, barley flour, ginger, cloves, cinnamon, baking soda, salt, molasses, and blueberry juice in a mixing bowl; beat until thoroughly combined. Stir the blueberries into the batter. Pour batter into a well-greased 1 1/2 quart casserole dish; put lid on dish. Bake in oven for 1 hour or until a toothpick inserted in the center comes out clean. Remove from oven, and let sit for 10 minutes, then remove from dish by running a knife around the edge of the dish and inverting on a plate. Serve either warm or cold. If desired, serve with whipped cream. A hundred years ago, there was a lot of food-related research, and people were beginning to understand the important role of vitamins and minerals in our diet. 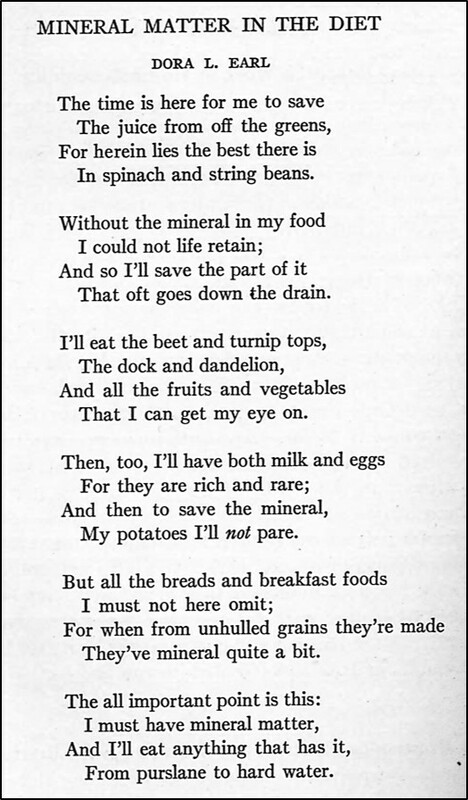 I was amazed to even find a poem in the Journal of Home Economics which encouraged cooks to prepare foods which contained lots of minerals. A hundred years ago, fresh fruit was scarce during the long winter months, so pies were often made using dried fruit. I found a wonderful recipe for a Fig Meringue Pie in a 1919 cookbook. 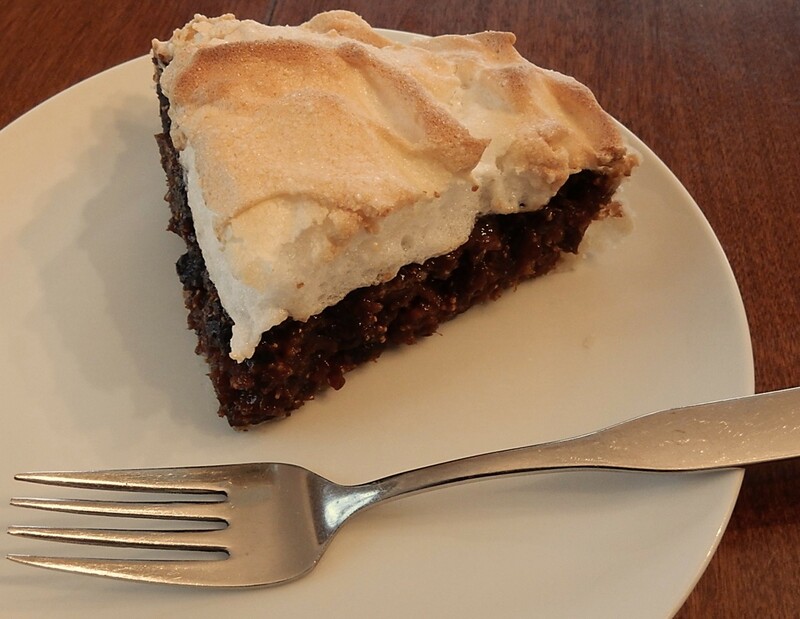 The delectable fig filling is topped with a creamy meringue. Remove stems from figs, then chop. (There should be approximately 2 1/2 cups of chopped figs.) Put chopped figs in a saucepan, add water. Bring to a boil using high heat, then reduce heat and simmer for 30 minutes while stirring occasionally. Remove from heat. In the meantime, preheat oven to 325° F. Place egg yolks, 2 tablespoons sugar, and salt in a bowl; beat together. Place a small amount (approximately 1 – 2 tablespoons) of hot fig mixture into bowl with beaten egg mixture, stir quickly to prevent eggs from coagulating. Then put this mixture in the saucepan with the cooked figs while stirring. Return to heat (medium), and cook until the mixture thickens while stirring continuously. Pour into a pie shell which had been previously baked. In a separate bowl make the meringue. Place egg whites in the bowl, and beat the egg whites until they form stiff peaks. Gradually add 4 tablespoons sugar while continuing to beat. Then spoon on top of the pie and swirl; sprinkle with sugar. Bake for 20 minutes or until the meringue is lightly browned. Ever have a cake that didn’t turn out quite right? Well, here’s some hundred-year-old advice for troubleshooting cake problems (and, amazingly, much of it is still applicable today). Heavy or fallen cakes are caused by having too slow an oven; by using too much sugar or shortening; by using too little flour; by having such a hot oven that the outside bakes so thoroughly that the inside cannot rise; by moving the cake in the oven before the cell walls have become fixed; or by taking the cake from the oven before it is thoroughly baked. Thick-crusted cakes are caused by too hot an oven, by using too much sugar and shortening, or too little flour. Coarse-grained cakes are the result of using too much leavening material, or of having too slow an oven. They are also caused by insufficient creaming of shortening and sugar, or insufficient beating of the batter before adding the egg whites. A”bready” cake is caused by using too much flour. 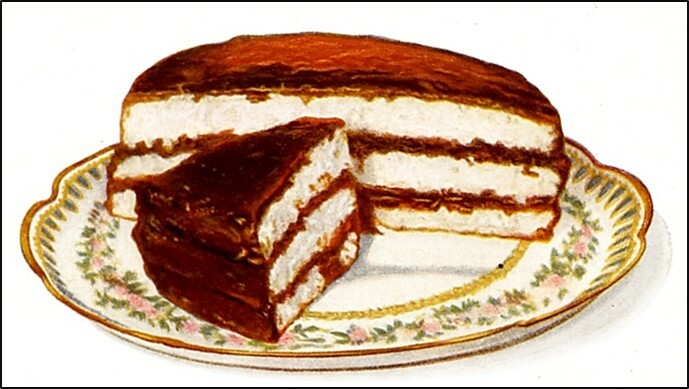 A cake rises in a peak in the center when the oven is too hot during the first few minutes of baking. A cake will crack when it contains too much flour, or when the oven is so hot at first that the outside bakes before the center can rise. Are you looking for a tasty, fun-to-make Valentine’s Day treat? Well, I may have found the perfect recipe for you. 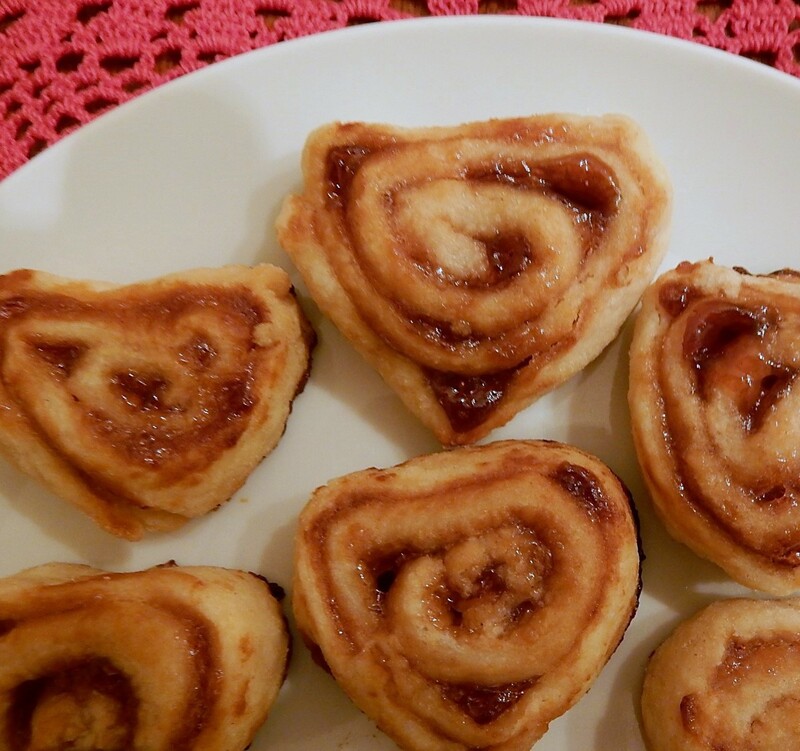 Pastry Hearts are made by spreading jelly on pastry dough, rolling into a log, slicing, and then shaping into hearts. The process of squeezing and pressing the dough to create the hearts was fun and felt a bit like playing with play dough. Preheat oven to 425° F. Roll pie pastry into a rectangle 1/8 inch thick. Thinly spread with jelly. Starting at the narrow end, firmly roll into a log-shape. Cut into 1/4 inch slices. Place slices on a greased cookie sheet. Shape into hearts by pulling into a point at one end, and pressing in at the other end. Use a paper towel to dab away any excess jelly. Brush with egg white and sprinkle with sugar. Bake for approximately 10 -15 minutes (or until lightly browned).